It’s Super Bowl weekend. I only know this because I was asked to come up with a cocktail you would want to drink at a party celebrating this fact. Well, it’s a drink that I would want to drink at this kind of party. And I guess the name is quite telling that I’d name it Steak Island, however, let’s talk about why I gave it this name. I go into this a little in the article I wrote on Serious Eats, but let me elaborate on this just a wee bit here. Since this is a safe place to ramble on and you readers are somewhat more forgiving of these overly long explanations (well, some of you aren’t and you know who you are). For the most part, I like to live an uncluttered life.. actually, let me stop you here if you’re just searching for “super bowl cocktails” and you’re still reading at this point. Might I suggest you just scroll down to the recipe? Anyways, I’m the type of person who loves, with a capital L, to throw stuff away and have lots of clean surfaces. I’m a believer that an uncluttered space means an uncluttered mind and yes, I might just use the excuse that the studio space is too cluttered to photograph in right now so I’m just going to be over here watching tv and procrastinating. But mainly I’m not a person who holds on to stuff. However, I do have a few exceptions for collectibles. The major collections I have are my Tiki mugs, which need a new cabinet (see, I still need to sequester the collections) and, since I used to DJ out here with much, much more frequency than I do now, my 1960’s girl group and girl garage band 45s. That was mainly it for stuff I held on to that took up space. You know what doesn’t take up a lot of space that is fun to hang on to if you’re into cocktails: vintage drink stirrers. These are highly curated because I can’t justify keeping more on hand than what will fit in a Highball glass. Knowing that I liked some of these kitschy treasures from restaurants and bars that once were, a friend of mine found herself at a flea market somewhere in Arizona a few years ago and happened upon someone’s stockpile of stirrers for sale. Sifting through the amazing variety of brightly-colored sticks, she selected what she thought I’d most like to have (and seriously did an amazing job). One of my favorites though was this black stick with gold lettering that just said “steak island” on it with this little grass hut. Either it was the bizarre combination of this little tropical hut imagined to house giant steak laden plates, or that it was coming out of Texas and I was to believe there was something tropical-like there, but either way, I immediately knew someday I’d need to make a drink in honor of this establishment’s namesake. Super Bowl Sunday seemed like the most appropriate “holiday” to make such a drink. 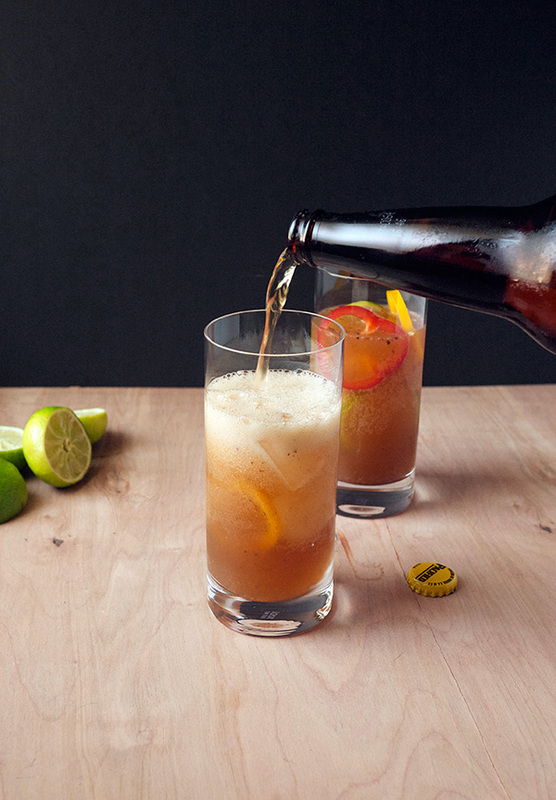 So what better to wash down plates of rich, meaty foods than some light and refreshing effervescent cocktails…made with beer! 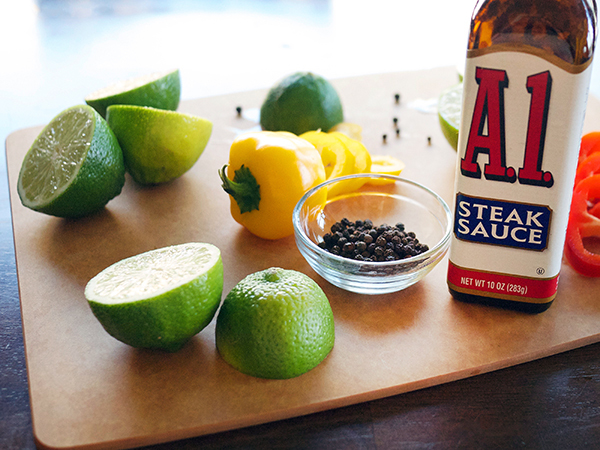 And… steak sauce! If I was going to make a cocktail that included the word steak, then I figured some steak sauce as an extra special ingredient was in order. So what you get is a drink close to a Michelada with a heaping amount of tangy, umami-filled A1 Steak Sauce (or whatever sauce you’d like). Personally, growing up I was not a fan of steak, but I did like dipping the steak in A1 and then sucking all the sauce off the meat and tossing the meat away (I wasn’t a picky eater but the texture of steak I found to be most offensive to my young self). Now I skip the formalities and just drink the sauce here. Intrigued? You should be, so let’s make some cocktails! Like I said, it’s super refreshing and easy drinking, a great pair to richer foods. 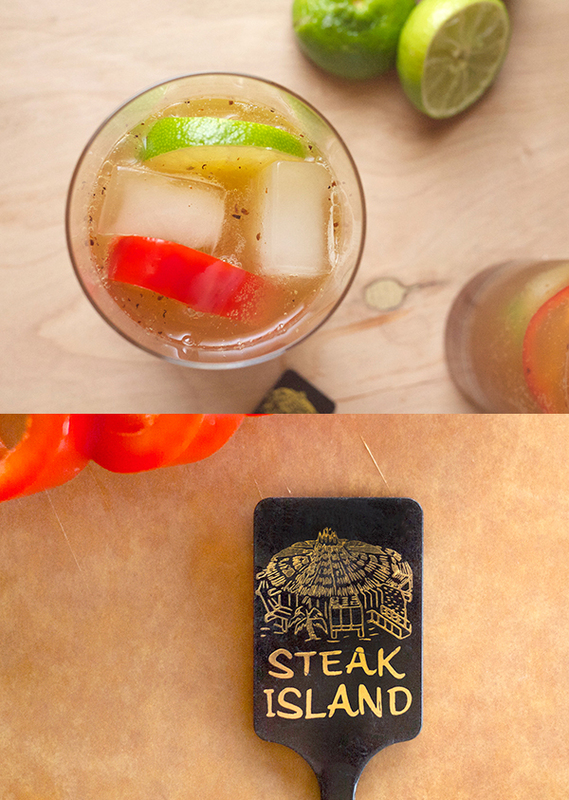 The steak sauce has a touch of sweetness and adds some underlying umami to the cocktail. Mixed with fresh citrus juice, it adds both a base note and a tangy brightness to your fizzy beer mixer. 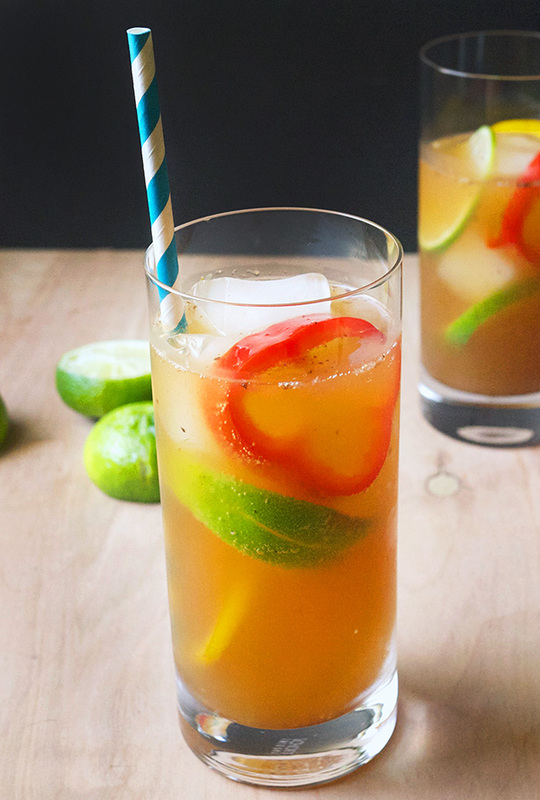 Muddled bell peppers offer a subtle vegetal flavor and complexity that’ll keep you sipping. I chose to top it all off with a lager so that the beer doesn’t overpower the drink with too much hops or bitterness or whatever special flavor it might have been brewed with. 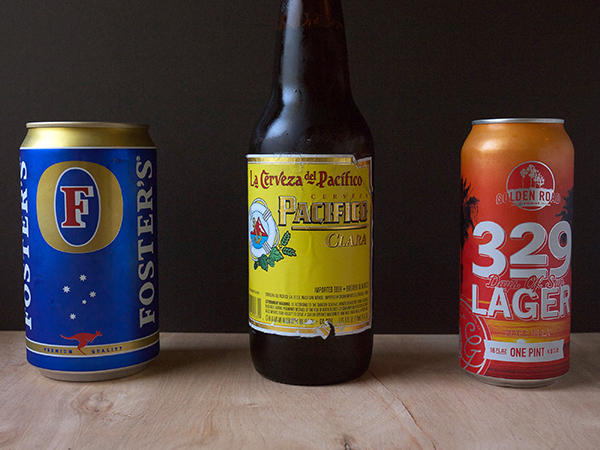 I enjoyed with Pacifico, Christopher liked some Foster’s with his.